During the winter months one of my favourite meals is Korean Tofu Stew and my favourite place for Tofu Stew (soondubu) is Buk Chang. I was a frequent visitor of their Christie location during university and have been to their Mississauga location several times as well. Now being a resident of North York, I’m at the Yonge and Finch location monthly, regardless of the temperature outside. Atmosphere: Whenever I go Buk Chang, there’s almost always a line at 7:00pm. Turn over at tables are quick so it’s rarely a long wait. Customers range from university students to families having dinner. It’s a casual spot that’s great for quick dinners or catching up with friends over a delicious meal. Service: The service is efficient. Food arrives quickly and it’s usually not too hard to flag down a server. It gets harder to get someone’s attention when they’re busy but it’s never become a pain point. I do love how menu items are priced so it’s a round number when tax is added. 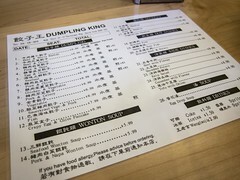 Food: The menu is concise and consists of only 9 items, 6 of which are tofu stews. Yum. 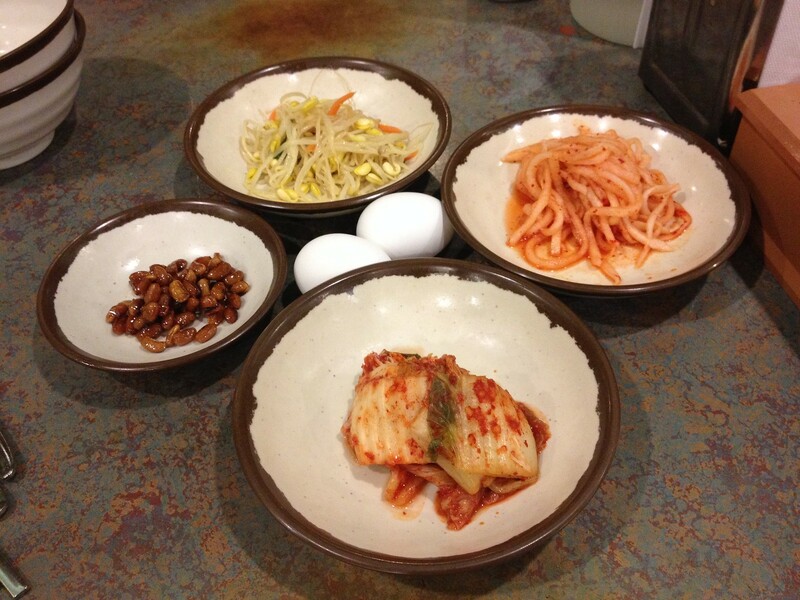 The 3 non tofu stew items are also served in a stone pot, the classic bibimbab and two beef soups. 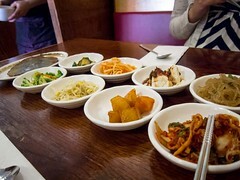 Every table is served an order of complimentary side dishes that include kimchi, sweet soy beans, lightly pickled bean sprouts and radish kimchi. I always polish off the soybeans before my soup arrives and need a refill. Each bowl of Tofu Stew can be customized for the level of spiciness and you’re basically picking your topping between the 6 menu choices such as dumpling, seafood, beef or vegetable. 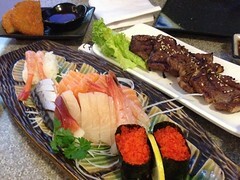 I always get the regular spicy combination, which comes with beef, shrimp and mussels topping the silken tofu. 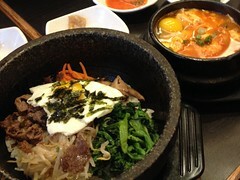 A stone bowl of steamed purple rice and a raw egg is served with each bowl of still boiling stew. Cracking the egg into the bowl as it’s set down results in a perfectly poached egg. 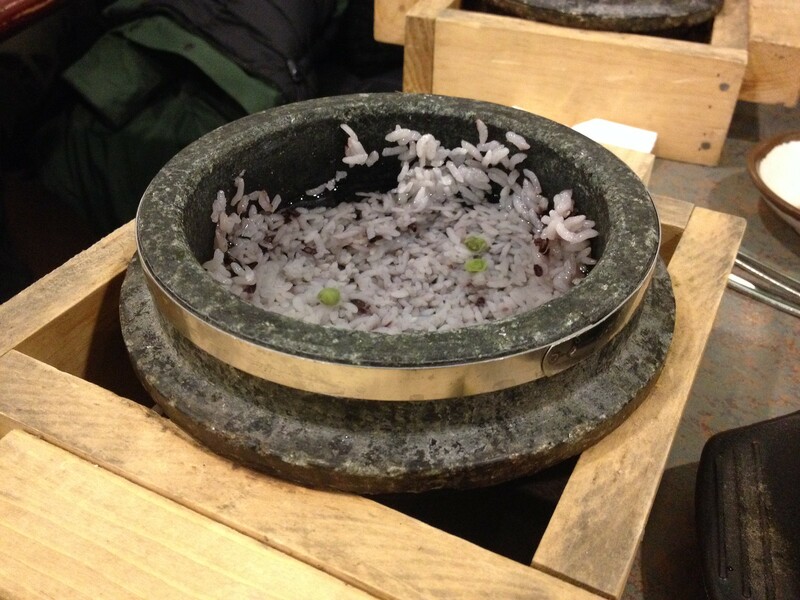 The server scoops the rice (a mixture of black and white rice kernels are mixed, which causes the purple hue) into a bowl and pours hot water into the stone one. 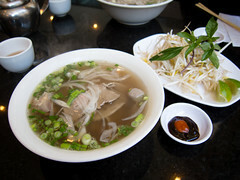 This makes a light rice soup from the burnt on rice, a perfect cleansing end to a meal full of strong flavours. The tofu is like butter and can be slurped up almost like a fine custard. The stew itself is on the saltier side but rich and savoury. The Star did a nutritional analysis on the meal and, yes it’s a lot of salt. I just drink more water the next day and acknowledge that the scale will be a few pounds heavier in the morning, it’s worth it. 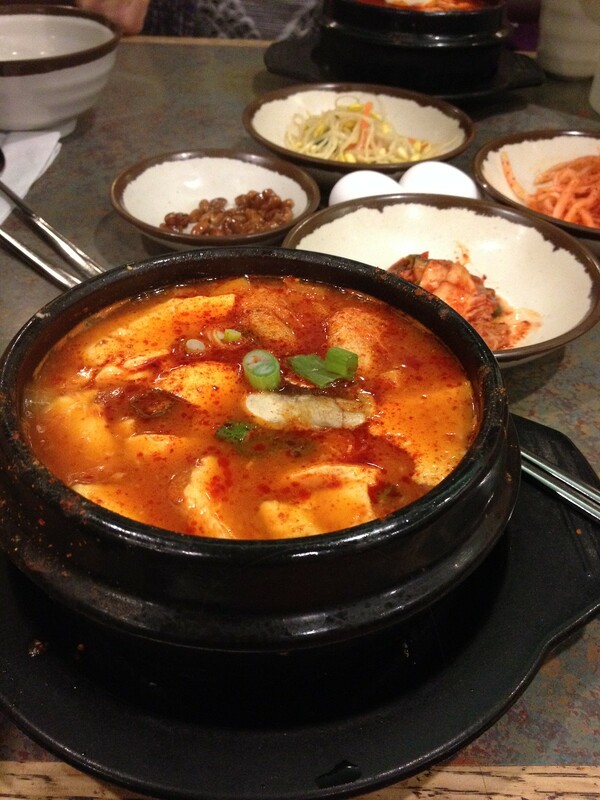 I tend to get the dumpling tofu soup — the dumpling skin soaks up all the spice mmm! You could also ask for extra spicy stew, too. mmm.